Nourishing pregnant mothers for healthy babies. Cultivating diverse crops. Cooking healthy meals. 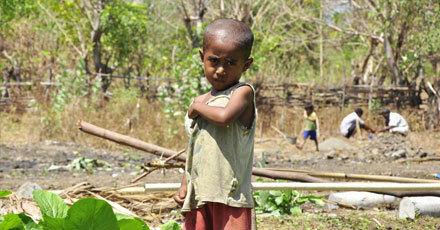 HIAM Health, a local NGO established in 2004, is a vital voice in Timor-Leste’s fight against malnutrition. 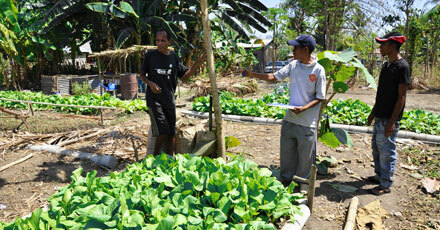 HIAM Health staff (with caps) help a father establish a Home Kitchen Garden. Typically, food shortages arise when the land is barren or suffering drought. However, Timor-Leste is so fertile, almost anything grows. So why are the Timorese malnourished? The face of Timor-Leste. He is the reason we endeavour. HIAM Health derives from the acronym of our tagline, Hamutuk Ita Ajuda Malu or "Together, we help each other". Only together, can we eradicate the misery of malnutrition. HIAM Health is supported by The Chain Reaction Project, a non-profit organization committed to help lives in some of the world's least-developed nations.